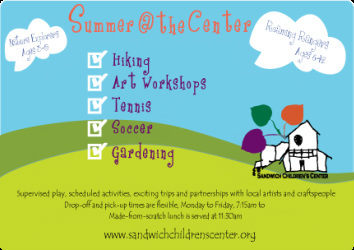 Sandwich Children’s Center summer camp offers a culture of creativity and warmth using nature as our classroom and play space, with the arts as a tool for giving voice to a child’s experience. All programs individually tailored to meet your child’s schedule. Program runs Monday to Friday 7:15 am – 5:30 pm accommodating your drop-off and pick-up needs. Part-time or full-time. Come for as many days per week as you may need, join us for one week, or come for all ten.